Hello Everyone, For the past few weeks I was writing a Whitepaper about maximizing SQL 2012 Performance for SharePoint 2013. It’s been reviewed by 4 great guys , and after being exclusive to SharePoint-Community.net for one week, I release it to the public! Read the abstract or download the Whitepaper Directly here! As a SharePoint Consultant I get to see dozens of SharePoint farms every year, and one of the most common complaints I get from clients – is that SharePoint is slow. A lot of people think that SharePoint is slow because the SharePoint servers are lacking resources or, simply, because SharePoint is a slow product. Although resources allocated to the SharePoint servers (e.g. Web Front Ends and App servers) are important, not a lot of people realize that SharePoint performance is directly related to the database, SQL Server. In fact, 94% of SharePoint data is stored in SQL. In this whitepaper, we will explore many options on how to optimize SQL Server 2012 for SharePoint 2013. Here is a high level overview of what we intend to explore. In this section we will review important best practices on how to format your disks, as well as how to plan where databases, logs and your Temp DB will be located. 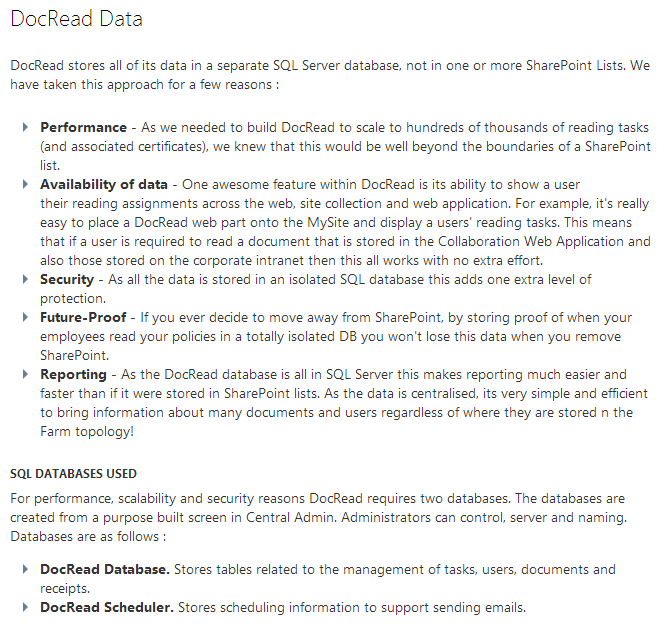 Furthermore, depending on the purpose of your SharePoint 2013 Farm, we will determine which databases are most important. In this section we will discuss what changes during installation can impact SQL 2012 Server performance and explain the reasons behind them. 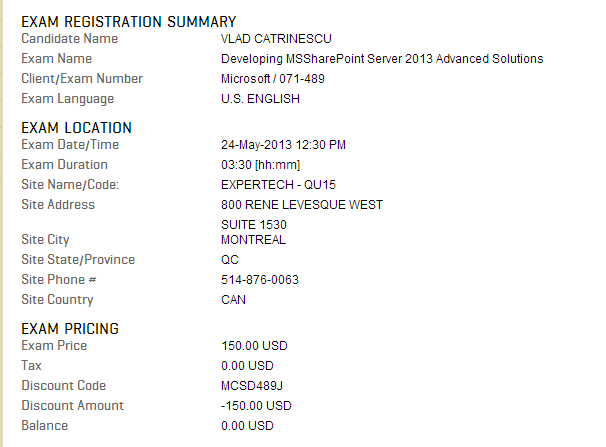 For example, did you know SharePoint 2013 uses a different collation than the default SQL one? In this section we will examine the changes required immediately after you have installed SQL 2012. This will ensure that we have the correct settings from the outset. We will cover everything from Initial DB size to Fill Factor to Instant File Initialization. Now that you installed SharePoint 2013, Web Applications are starting to be created, content is added. Unfortunately, if you want to keep your SharePoint fast and your users happy, your job is not done. In this section we will make a list of things you need to check and modify, together with a schedule. Luckily, since we made things right in the Post Installation changes, you won’t have to do them very often. Every month I do an article about all the resources I found online about SharePoint 2013. These free Resources come from Microsoft directly or from other partners but unfortunately not a lot of people check regularly and sometimes they are well hidden. I am happy to present you Part 6 of the “Free SharePoint Server 2013 Resources” series that gives you all the resources for the month of March. CKS Dev for Visual Studio 2012 is now available! Microsoft released today an Important Security Update for SharePoint 2013. However, be careful with the details! This security update resolves a publicly disclosed vulnerability in Microsoft SharePoint Server. The vulnerability could allow information disclosure if an attacker determined the address or location of a specific SharePoint list and gained access to the SharePoint site where the list is maintained. The attacker would need to be able to satisfy the SharePoint site’s authentication requests to exploit this vulnerability. This security update is rated Important for all supported editions of Microsoft SharePoint Server 2013. For more information, see the subsection, Affected and Non-Affected Software, in this section. This security update requires prior installation of the SharePoint and Project Server 2013 cumulative update package that was released on the Microsoft Download Center on March 12, 2013, and on Microsoft Update on April 9, 2013. This package contains the cumulative updates for both the SharePoint and Project 2013 applications, and it is available from the Microsoft Download Center and from Microsoft Update. So before you try to install this security patch, make you you install the SharePoint Server 2013 March Cumulative Update! So, patch your SharePoint 2013’s to the latest CU and install this security pack. But be careful if you do it in production, as the March CU might take hours to complete, and this security patch might require a reboot! By the way, the Great SharePoint Survey by SharePoint-Community.net is now open and we would love to hear what you think about the new features in SharePoint 2013! Furthermore, three random persons that filled the survey will win a free O’Reilly e-book of your choice! Check out the Great SharePoint Survey 2013 here. This is really interesting. Similar to the 70-489, on the Site, the exam is supposed to be for Visual Studio 2010. I was really expecting it to be with Visual Studio 2012. The typical candidate usually also has familiarity with SharePoint capabilities and with Online Services such as Windows Azure and SharePoint Online as well as developing Office client apps. Manage the site life cycle. Implement application authentication and authorization. Plan and implement user authorization. Design solutions to handle large amounts of data. Access data contained in SharePoint. Manage SharePoint Object Life Cycle. Create event receivers and timer jobs. Create and deploy Microsoft Visual Studio workflows. Manage the App life cycle. Only for fun, I took a look on the Prometric Website and saw that the 71-488 and 71-489 exams are there already. That would confirm the time frame I posted in February. SharePoint 2013 MCSD Beta exams. They got the name of 70-489 Wrong. Other good news is that everyone seems to be able to the those exams at your local Prometric Test Center. I didn’t enter my Credit Card and scheduled it see what happens, however I think it would pass. If you go pass the beta, come back and tell us how it was in the comments. (Tell us what you can without violating your NDA of course). You might be wondering why I haven’t posted much technical stuff lately, truth is I have been busy with work and my other Community site. As many of you know I co-founded the SharePoint-Community.Net with a few other SharePoint people. One of the fellow founders who I have got to know very well is Mark Jones. When Mark isn’t spending many an hour embedded helping me with the community he is working on his other passion – DocRead for SharePoint. As both a thank you and also because I am an inquisitive guy I asked him for a download of DocRead so that I could road test it and write a review. So here we go. 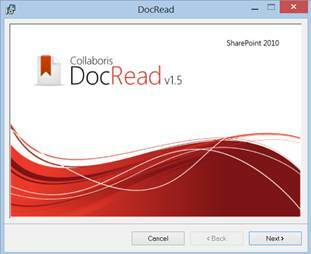 DocRead allows you to assign documents (stored in SharePoint document libraries) to groups of users. Once sent out you can then monitor who has and hasn’t read them via a set of reports which are all accessible from SharePoint pages. Collaboris market it as a system to help distribute company policies, procedures, employee handbooks and so on, but really, this could be used for anything. Project documents, User Guides, Financial Results, Company Newsletters, etc. In fact, if you have a document that needs to be signed-off or even one that’s a ‘recommended’ read then using DocRead makes this a very simple task. So, here goes this is what it’s like to use right from the install to an end-user using it. DocRead uses a top-down approach to when it comes to configuring. (e.g. the Farm Admin does some configuring, then hands over to the site collection admin who then hands over to the Site owner and so on..). · And where to install Reporting. 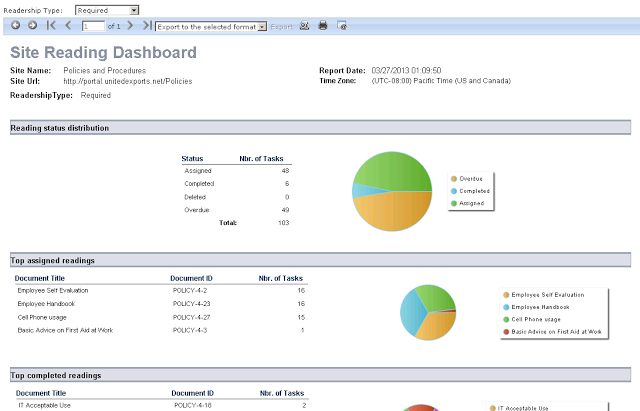 I looked into this and DocRead uses Telerik for their reports, which is deployed as a web app feature. This is optional, but I think reporting is the best part of the product. · Viewing logs – all the error and informational messages get put into the DocRead database. · Licensing – you can view full details of the license key, plus insert a new key as required. Once the business have decided (and I stress business as they will be the ones to use DocRead), which sites they want to use DocRead on, it’s upto a person with “Full Control” permissions (usually the site owner) to activate DocRead on that site. 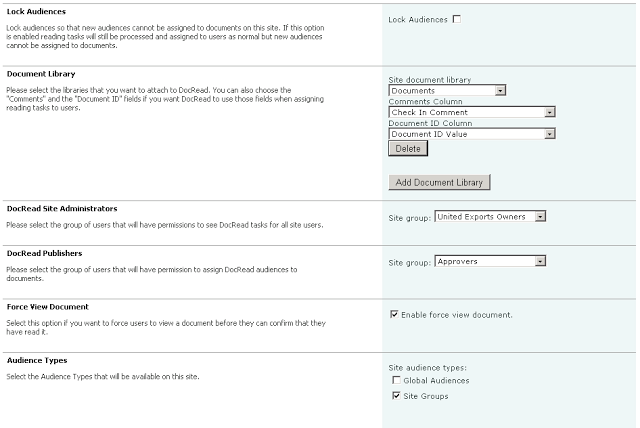 · Add the DocRead Web parts to pages in SharePoint. These will probably be high hit pages (like home pages) so that you users are alerted as soon as they goto them. · The person in this group can assign a document to a group (via edit properties). This is very straight forward – all you need to is go to the ‘DocRead site Settings’ screen and ensure you doc library is added into the list. 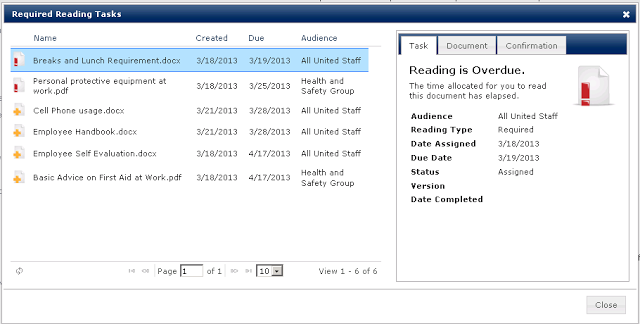 Then, when this is done find the document you want to send and pick some groups or audiences. You also need to specify how long you want users to read the document before it’s overdue. At this point, things turn red in the web part and overdue emails will be sent out. 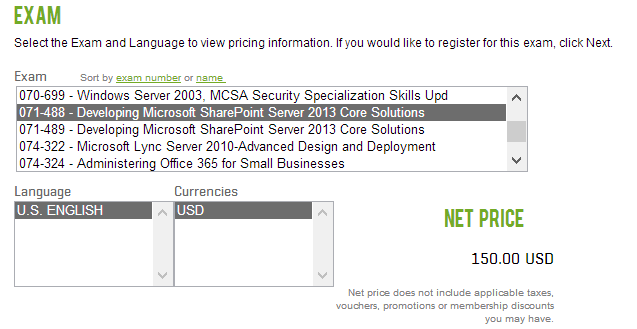 One gotcha here is that you need to be a member of the SharePoint group that you set up as ‘DocRead publisher’. If not these columns can’t be set. So for example, if I am not in the ‘Approvers’ group I can’t send a document out with DocRead. 1. Performance. 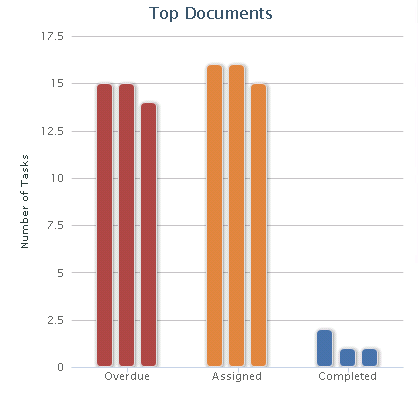 DocRead is installed in some very large organizations who have a large number of documents and large number of users. To send out 1000’s of emails (on a daily basis) isn’t something you want your SharePoint servers to necessarily be doing. 1. Assign a ‘Required Audience’ called ‘Health and Safety Users’ to a document called ‘Health and Safety Guidelines.doc’ and give them 36 days to read and confirm. 2. 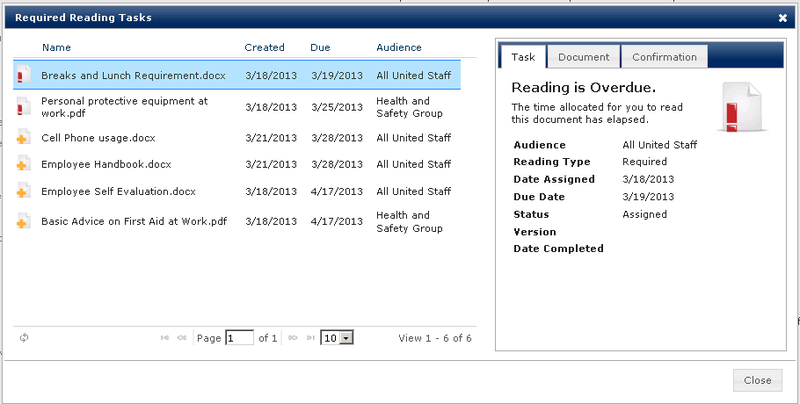 Let DocRead create new reading tasks for everyone in the ‘Health and Safety Users’ group. 4. 6 months later a new starter joins the company and gets put into the ‘Health and Safety Users’ group. 5. DocRead realises there is a new user who has not been asked to the read the ‘Health and Safety Guidelines.doc’, so it creates them a new reading task and gives them 36 days to read and confirm. Imagine, just how cool that is ? Once you have configured your documents to groups or audiences, DocRead will monitor the group or audience for new entrants and ensure they are kept in line with company policy. This feature alone sells it for me! I also tested to see what happens if you remove a user from the group…If this happens the user isn’t any longer required to read that document (and a negative receipt is created). One major part of this puzzle is around reporting. Once a publisher has sent out tasks to their employees they really need to be able chase and track who has read what. I imagine this would be especially important for documents that go to all employees in large orgs. DocRead ships with reports all pre-configured via one of the menu items in ‘Site Settings’. Once you click Report you are taken through to a page that allows you to view reports. As you would expect, the reports can be printed, exported and filtered and so on. One nice feature would be to be able to create new ones, but there isn’t a way. However, I also asked Mark and he informed me that they can create custom reports if needed or a customer can hit some of the views in SQL to dev their own in something like SQL Reporting services. 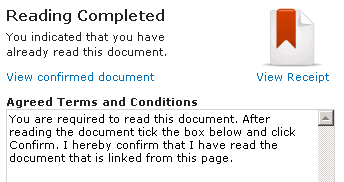 I noticed that when a user confirms a document, a new icon appears on the popup saying ‘View Receipt’. This receipt shows that a user confirmed reading a version of a document at a certain time (think of it similar to an outlook receipt). 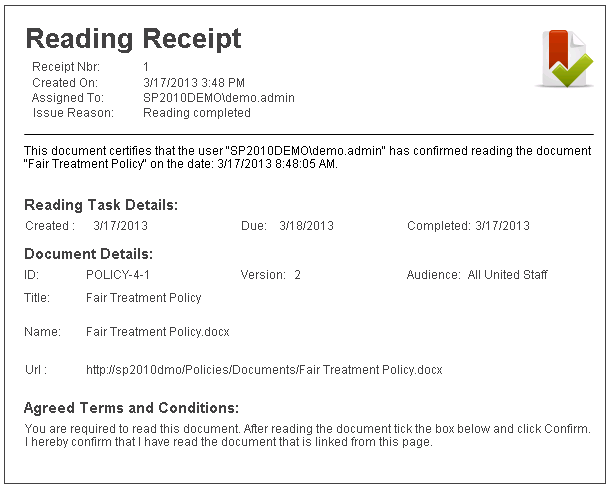 Receipts are also accessible from a report by DocRead Admins. There is also the concept of a “negative receipt”, which will get created if a user doesn’t confirm a document. For example, if the document is deleted then they can’t read it any more. Not sure of the reason for negative receipts, but I guess there’s some auditing requirement that it meets.. The other set of web parts are the charting web parts which give a visual way to see the break down and status of all the tasks in that site. These would be good on home page of the site in particular so that the publisher can see what’s happening. Being the admin I am – I decided to try some tricky stuff out to see if DocRead threw a wobbly and it held up really well. 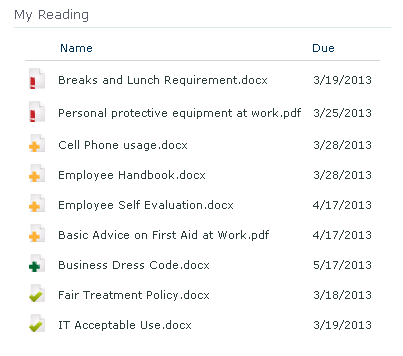 For example, if you assign 5 groups to a document to read and one person is in 4 of those groups, this still works fine. The user only sees 1 task but 4 are created behind the scenes. When they confirm – all the docs are confirmed. I also tried assigning 5 documents in different libraries, created the tasks and then deleted the libraries containing the documents (evil I know). At first the tasks remained then I noticed they got deleted. After more investigation, I noticed negative receipts were created. I asked Mark how and he mentioned that a Central Admin job synchronises what’s in SharePoint with what’s in DocRead. The other cool thing, if you restore the libraries then run a feature at the site level, back they come! · Via one of the emails sent out to the user. · When navigating to the document library containing documents that are configured with DocRead – there’s a new menu on the Ribbon. 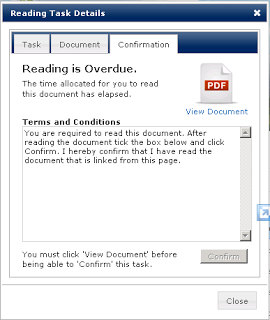 Regardless of the ways to see the tasks, you will always finally end up with a ‘popup reading window’ which gives the user the ability to read about the document, see information about the task and more importantly be able to confirm the document. To be honest it doesn’t really require too much explanation – it’s pretty straight forward and looks like this. Once they click the ‘view document’ the button is enabled. Overall, I have got to say I mightily impressed and I think it’s an awesome solution to have in your SharePoint toolkit. From an Admins point of view I really like that they have thought about performance and security as the last thing you would want is this tool on all libraries in use by everyone. I am also glad Mark pointed me in the direction of Smart Move as this really is ‘smart’. It’s outstanding to think that you could send a document to ‘all staff’ and then as users join or move around, DocRead will always keep them up to date. That is a huge time saver. If you have any more questions check out the Collaboris site or email Mark himself! That’s it for now, and don’t worry, I have some really cool and useful SharePoint articles coming up! 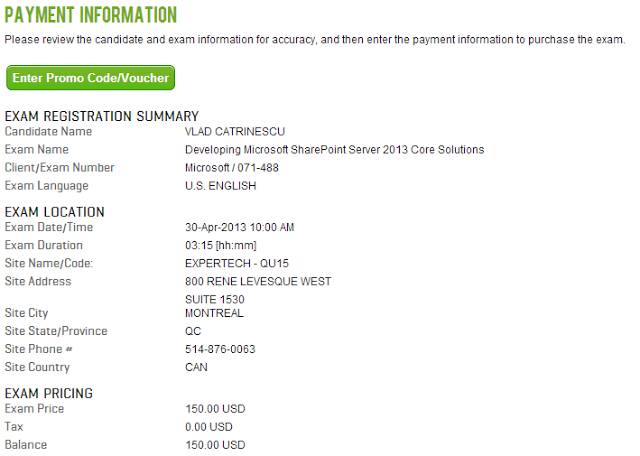 A while ago I posted the Three New Facts on the SharePoint 2013 MCSD Certification! – A Name, Exam Numbers and a Date! 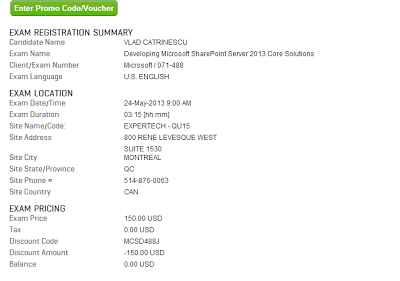 which confirmed the exams required for SharePoint 2013 MCSD were 480, 486, 488, 489. 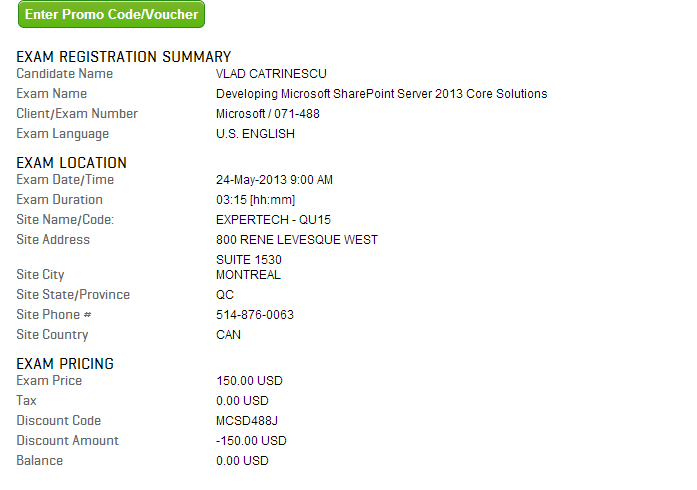 At the time of that post, there were absolutely no details about the two SharePoint Exams. However, last week Microsoft finally published details of one of the exams, 70-489 . Thanks a lot to Fan Zhang for telling me the details are up! This is really interesting. 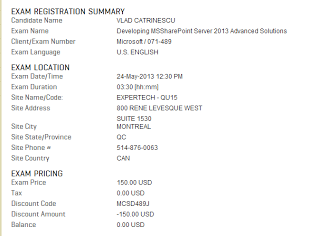 On the Site, the exam is supposed to be for Visual Studio 2010. I was really expecting it to be with Visual Studio 2012. Also, there is another thing worth noting. The official MCSD SharePoint title will be : Microsoft Certified Solutions Developer (MCSD): SharePoint Applications.